With tobacco selling for four shillings per pound onshore, but only eighteen-pence at sea, English seamen had a strong incentive to purchase their supplies offshore. To meet this demand, Dutch vessels known as ‘copers’ (from the Dutch k?pen for ‘to buy’) were sailing with the north-sea fishing fleets, but in addition to selling tobacco to the seamen, they also functioned as “grog-shops.” As a result, drunken seamen were routinely endangering not only themselves and their ship-mates, but even their boats. Concerned about this situation, Ebenezer Mather, founder of the Fisherman’s Mission, reasoned that, by equipping a mission vessel to accompany the fleet, he could help address the issue. The mission ship would finance itself by fishing, but also carry a missionary, a medical box, and a substantial quantity of cheap tobacco, the latter to be made available at cost price and without the accompanying temptation to drink. By 1883-84, Mather had already secured the support of tobacco manufacturers, launched a mission smack, and proved the model worked, so he decided to acquire a further three boats. The first, the Salem, he purchased from a Hull smack-owner, but the other two, the Cholmondeley, and the Edward Auriot, he had specially built at Restarick’s shipyard, as was the mission’s fifth smack, the Edward Birkbeck. The Edward Birkbeck’s launch was photographed, and the picture graces many books on Bideford history. Restarick also built ships for a range of other clients. The last boat launched from his yard in 1886, in the process becoming caught by the tide and causing slight damaging to the Long Bridge. 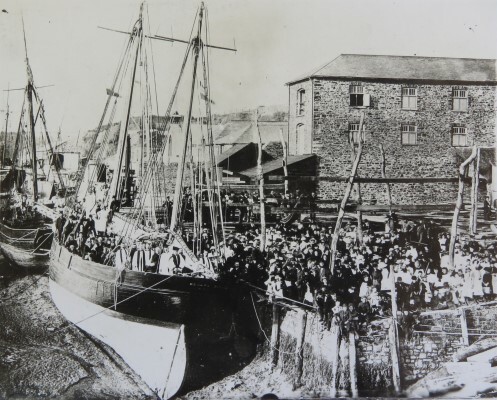 In 1887 Restarick’s Yard was purchased by I. Baker and Son, Merchants, under whose ownership a new sea-wall was constructed, and it became Brunswick Wharf. The Baker’s warehouse sign is a familiar landmark at the eastern end of the bridge.